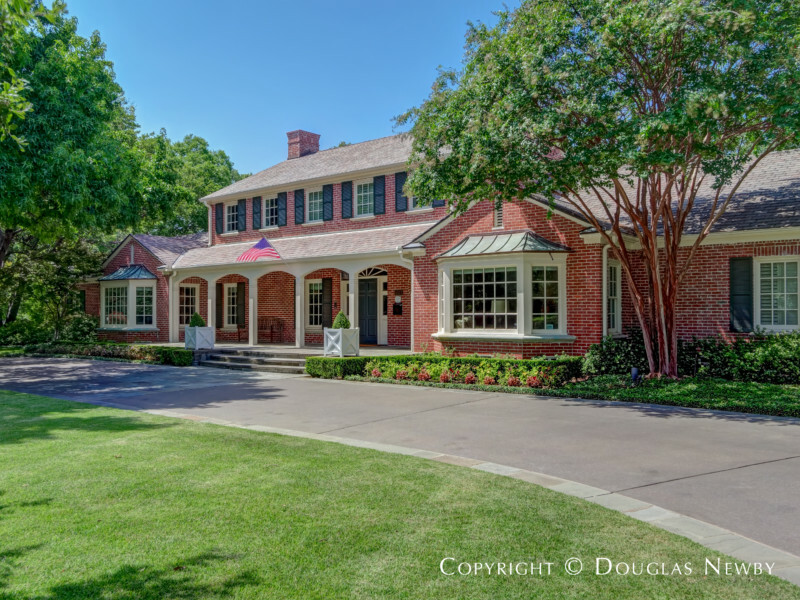 Fooshee & Cheek-Designed Renovated Home at 5373 Wenonah Drive in Greenway Parks Offered by Real Estate Broker and Realtor Douglas Newby Who Offers the Finest Architect-Designed Homes, Architecturally Significant Estate Homes and Modern Homes For Sale in Dallas, Texas. This very wide lot was originally two and a half lots that were assembled together. The property’s visual expanse of green is extended even further by the Greenway Boulevard park on one side and the triangle park serving as a backdrop for the side and backyard. Walking by 5373 Wenonah brings a smile. Looking out from the front porch of the home brings a smile. 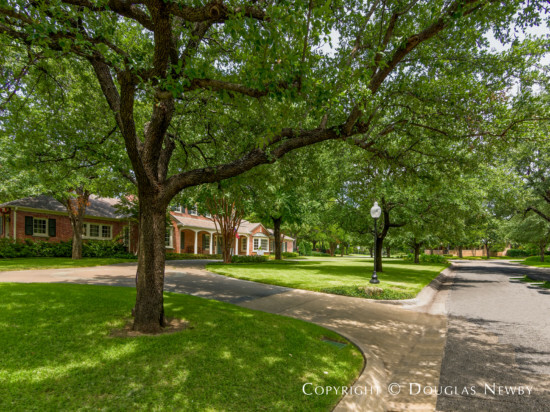 There is a reason Greenway Parks is one of the most popular neighborhoods in Dallas. 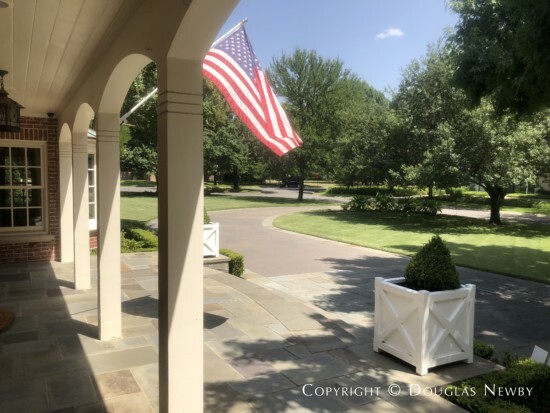 Where else is there a well defined small neighborhood with a concentration of extremely successful professionals and principals of dynamic companies and investment funds that still exudes a friendly front porch tranquility. 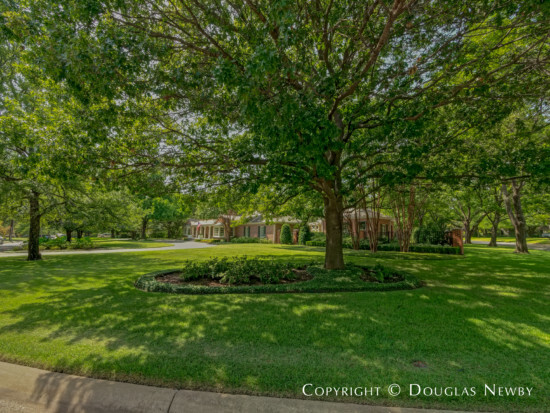 From the front porch you will look out at the gardens, wide lawns and tall trees in the distance rather than the blank walls of large homes built on lots too small found next door in most neighborhoods. The design of this home celebrates the outdoors. 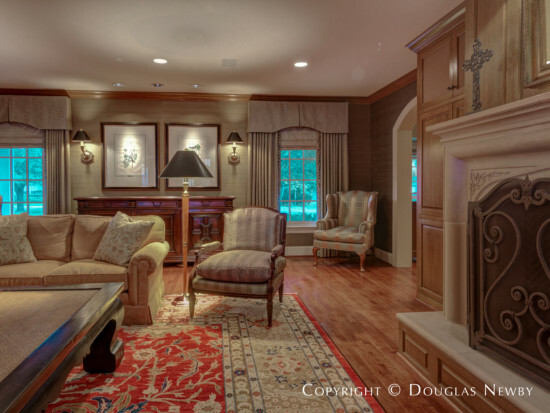 A classically traditional looking home opens up as you enter the public spaces. 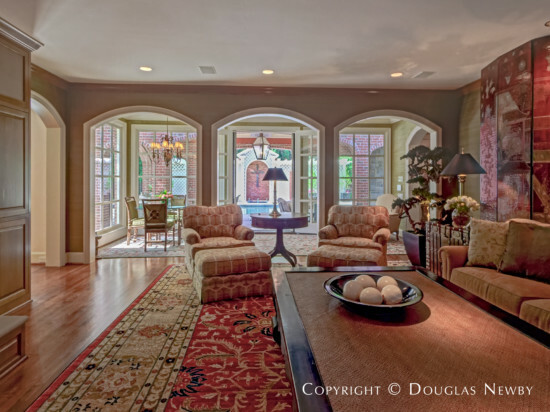 Walls of windows and arched openings contribute to the spaciousness of this already very large living room. The formal rooms connect to each other and to the kitchen as well as the open and screened porches. The open spaces connote modernity while the classic proportions and spaciousness suggest elegance. From the living room you look through a series of three bowed arched openings to a wall of windows and double French doors allowing you to visually connect to an outdoor room with screens that are operated electronically. This space is almost more pavilion than porch. 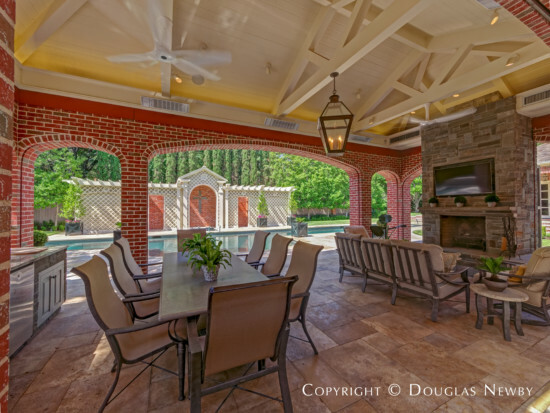 It includes a dining room, a living area, an outdoor kitchen, and an outdoor fireplace, all steps away from the pool. 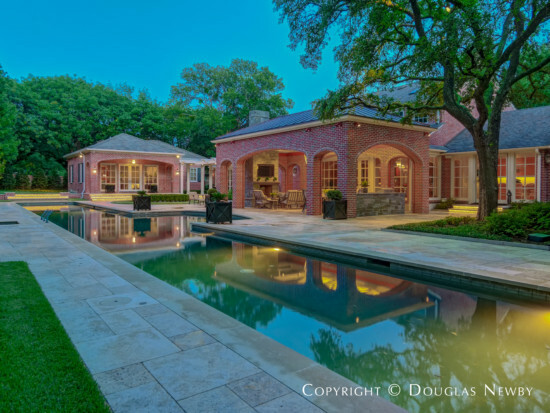 Many have said the pool is the longest residential lap pool in Dallas. 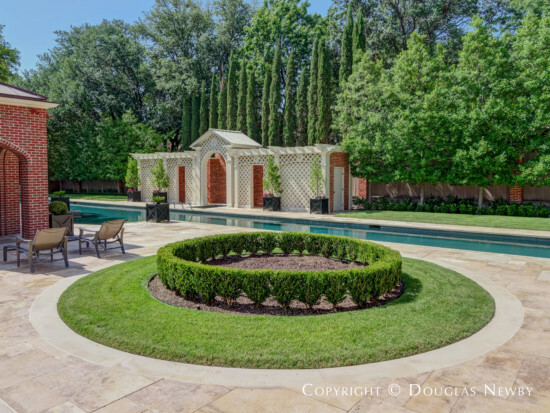 Some will view the pool as an extraordinary aquatic feature that connects the gardens and lawns on both sides of the house. Others will see the pool as a dream come true, a 35-yard pool to swim laps, longer than the competitive length of collegiate pools. 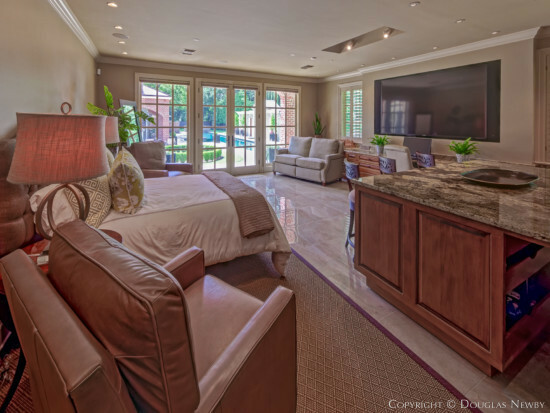 Running the length of the home, you will also enjoy views of the pool from the kitchen, breakfast room, living room, master bedroom, second bedroom, guest bedroom, and the art studio. 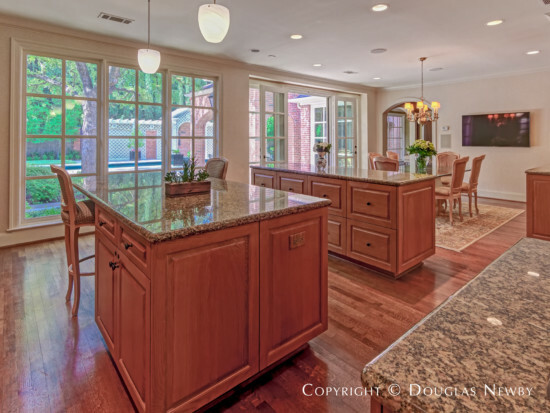 The kitchen in this Greenway Parks home connects to the dining room, large open breakfast room, and living room and it is also just a few steps away from the screened porch with screens that are operated electronically. Most kitchens are a magnet when people are visiting or there is a party. This kitchen is so inviting and elegant one does not even fully comprehend they have arrived in the kitchen. That is not to say it is not a wonderful working kitchen, because it is. 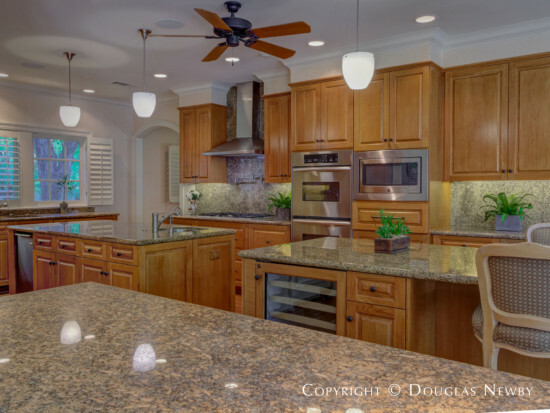 The kitchen has three work islands, plenty of space for seating, abundant cabinet space, multiple sinks, instant hot water, double ovens, a wine cooler, ice maker, and a gas stovetop with hood. The room is bathed in the abundant natural light that fills the space. Since the kitchen runs the depth of the home, windows are found at the front and rear of the kitchen with easy access to the outdoor living space, pool and three-car garage. The formal dining room is similar in size to the dining room of many of the largest estate homes. 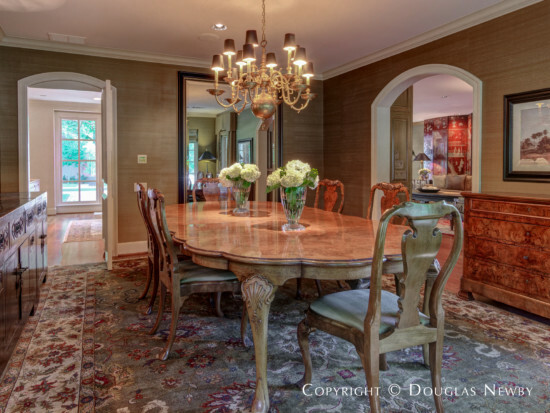 Even this large formal dining room is visually open to the breakfast area, pool and formal living room. 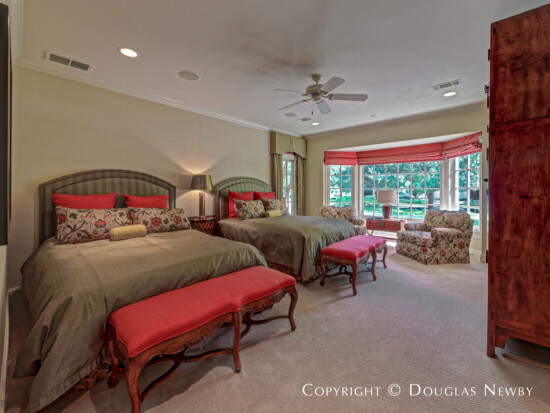 Located on the first floor of the home, the master bedroom enjoys views of the pool and courtyard garden. 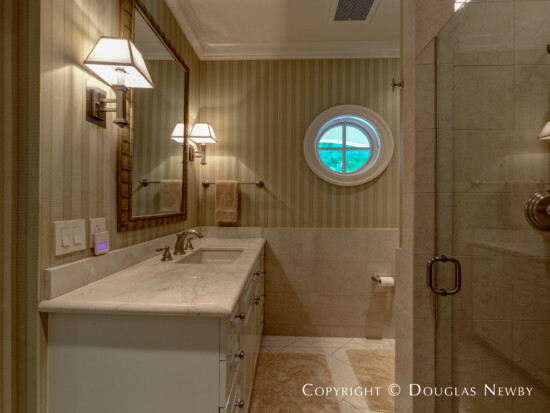 The master bath with the tile floor has separate vanities, a glass enclosed shower, separate bathing tub and ample storage. There is also an expansive closet with tasteful finishes. In addition to the master bathroom, two other bedrooms are on the first floor of the home and a third bedroom is found on the second floor. Each of these have their own bathrooms that are classic and elegant along with sizable closets. Whether it is a bay wall window to view the front lawn or a wall of windows with views of the pool, each bedroom has views of the verdant landscaping found in almost any direction one looks. On the second floor a commodious home office has crosscut floors and windows overlooking the rear garden and pool. In a nod to the contemporary movement of combining work spaces with workout facilities, this office opens to a very elaborate home gym. 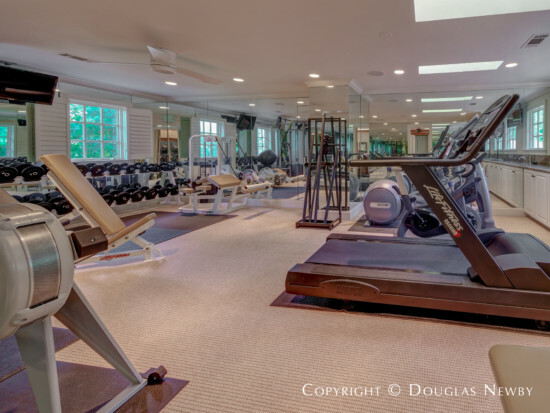 Seldom can one call an exercise room or home gym a beautiful room. Here you can. Mirrored on the ends, with the flanking long walls pierced with multi-pane windows, the room projects a serious space for a professional workout and a lovely space just to spend time. This separate building with a series of windows and French doors overlooks the pool and creates a large private courtyard effect with a rear terrace and garden. It is a serious space for an artist. A movable art studio table and cabinetry were designed for making art, storing art, and holding supplies. In addition, this charming building, with approximately 980 square feet, found at one end of the pool can serve as a guest cottage or recreational space. The site plan for the home and detached art studio provide an open courtyard. Space between the buildings provides sunlight and breezes. The dense stand of landscaping and trees further enhance the privacy for the pool, terrace, and garden. To find out more about this architecturally significant home in Greenway Parks, please contact Douglas Newby.